The Blue Cross Blue Shield Tower (BCBS) is located on the north end of Grant Park along E. Randolph Street at the NE corner of Randolph and Columbus Drive, in Chicago, Illinois, United States of America. The building's address is 300 E. Randolph. The building is located next to the Aon Center and original plans hoped to connect the two buildings via an underground pedway but the plans never came to fruition. Architect James Goettsch of Goettsch Partners designed the building. The Boeing International Headquarters (colloquially known as the Boeing Building and formerly known as the Morton International Building) is a 36-floor skyscraper located in the Near West Side of Chicago. 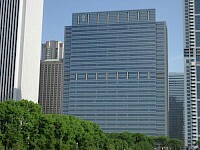 The building has been made the corporate headquarters for Boeing, which decided in 2001 to move to Chicago from Seattle. 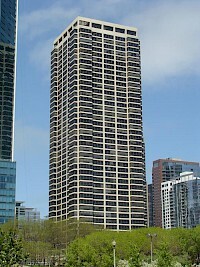 100 North Riverside Plaza is poised on the west side of the Chicago River directly across from the downtown Loop. 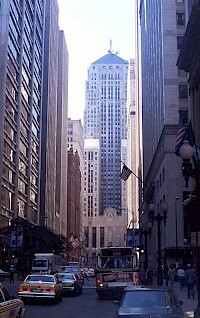 The Brooks Building in Chicago was built in 1909–1910 in the Chicago School architectural style. 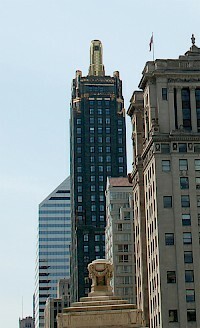 An early example steel-framed skyscraper, the structure was commissioned by Peter Brooks and Shepard Brooks and designed by architects Holabird & Roche. 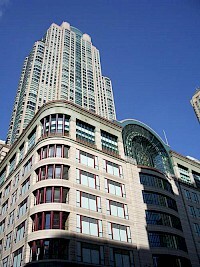 The building was was designated a Chicago Landmark on January 14, 1997. 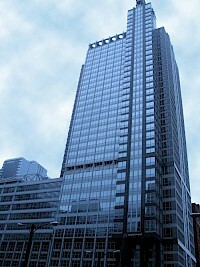 The Buckingham, formerly known as Buckingham Plaza, is a 44-story all-residential condominium designed by Fujikawa Johnson & Associates. 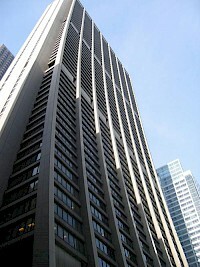 Located on East Randolph Street in Chicago, Illinois, the building sits between the new 340 on the Park building to its west and the older Outer Drive East building to its east. Two parks, Millennium Park and Lakeshore East Park, are immediately located to The Buckingham's south and north faces respectively. 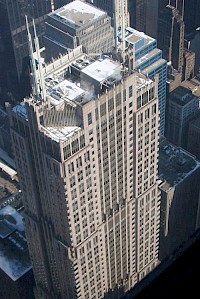 The Carbide & Carbon Building is a Chicago landmark located at 230 N. Michigan Avenue. The building, which was built in 1929, is an example of Art Deco architecture designed by Daniel and Hubert Burnham, sons of architect Daniel Burnham, and was designated a Chicago Landmark on May 9, 1996. Originally built as a high-rise office tower, the Carbide & Carbon Building was converted in 2004 to the Hard Rock Hotel Chicago. The building has 37 floors and is 503 feet (153 m) tall. Chicago Place is a mixed-use high-rise on the 700 block of North Michigan Avenue (between Huron and Superior) in Chicago along the Magnificent Mile anchored by Saks Fifth Avenue According to the Chicago Tribune, as of Feb 2009, the mall portion is now shuttered and will be converted to office space. Above that is a tower containing condominiums.